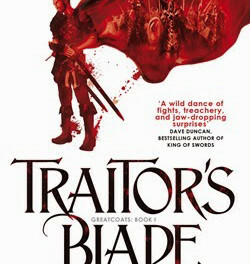 A mysterious, masked woman drags Falcio from his fairly straightforward life of worthy, paid employment, and with a magical powder, a murder and a rather neat frame job, Falcio and his fellows are branded traitors and forced to go on the run. Unfortunately for Falcio his bad fortune is not set to end just yet. 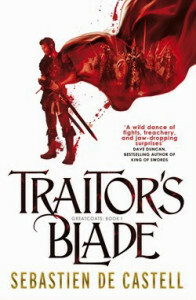 With a wonderful introduction, which speaks straight to the heart of the reader’s desires and dreams of the great fantasy adventure and a future yearned for, Traitor’s Blade tells a tantalising story, set in an addictive world where the barest hints of magic tangle with intrigue and humour. The first person narrative, told by Falcio throughout the book, connects the reader to his plight consistently, and there is a sense of the ‘great, classic’ tale in the voice and the way it is used. He speaks as though a mentor to an eager pupil, and the reader wants to hear more. Falcio’s history is revealed slowly as the narrative progresses, to tie in his actions and behaviour with the action in the present. Traitor’s Blade is a page turner in the true sense of the phrase and gallops through to an exciting conclusion which feels very much like it is only the beginning of Falcio’s tales and traumas. Witty, romantic and atmospheric in the way of great adventure stories, the Greatcoats series looks set to be a thoroughly enjoyable one.